Fort Stevens was a coastal defense fort and saw active service from the Civil War days to the end of World War II. Fort Stevens State Park, in addition to excellent camping and RV facilities, has many interesting artifacts from its fort days that continue to intrigue visitors. Examples are the reconstruction of the Civil War earthworks – still in progress: Battery Russell, the gun battery in the line of fire from a Japanese submarine during World War II, and the near-by Pacific Rim Peace Memorial: Battery Mishler, a one of a kind battery and the underground command post for the Columbia River forts. 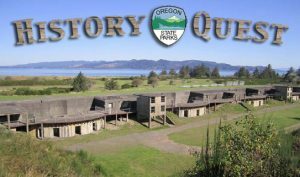 The mission of the Friends of Old Fort Stevens is to preserve, improve, restore, interpret, and promote historic Fort Stevens and its environment in cooperation with the Oregon State Parks and Recreation Department. Future generations of visitors to Fort Stevens, State Park will enjoy an integrated and fully interpreted campus. Each visitor will receiver courteous treatment from Friends of Old Fort Stevens and Fort Stevens State Park staff and employees. Generally accepted business practices will be applied to all public activities, transactions and organizational management. Local volunteers are important for assistance with projects. Visitors will understand the history and purpose of both Fort Stevens and the Harbor Defenses of the Columbia. It is important to develop visual footprints of Fort Stevens structures. Dialogue with local, state, and federal agencies and congress is important to insure the preservation of the Historic Area. Continuous support will be provided for the Fort Stevens Cemetery. The Friends of Old Fort Stevens is a 501(C)3 nonprofit corporation.